The total solar eclipse of August 21, 2017 was by far the most incredible experience of my life. As the moon began to pass in front of the sun, the ambient light and heat quickly faded and it went from a hot late morning to night in just a matter of minutes. As totality struck, spectators at Smith Rock State Park began to cheer and their howls and echoed throughout the valley creating such a surreal environment. While totality only lasted just under two minutes, it was an unreal experience that left me in complete disbelief and covered with goosebumps. 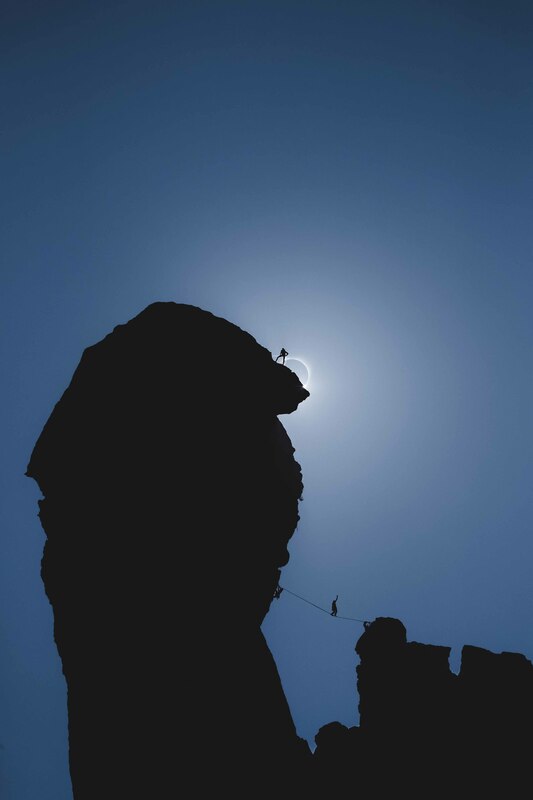 I’ll never forget the feelings I felt while watching the moon completely cover the sun and perfectly align with the rock climber that I had previously planned and positioned with fellow photographer Ted Hesser. 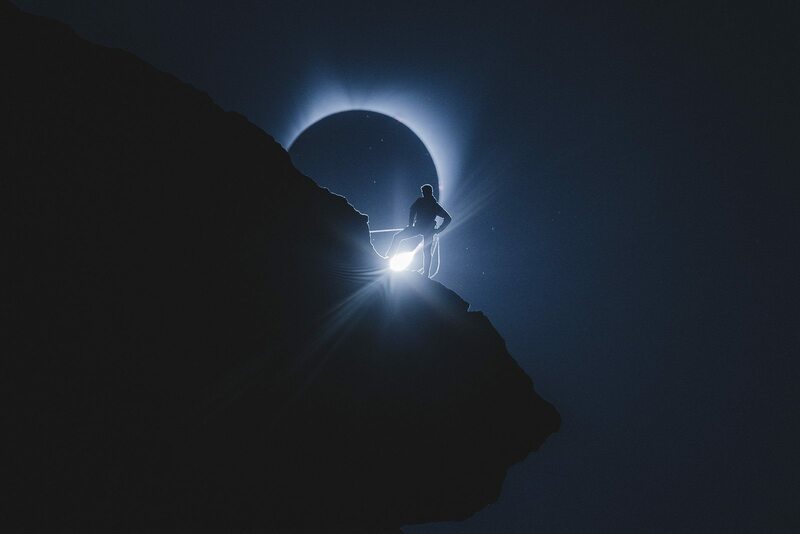 After totality faded, I reviewed the photos on my camera and a surreal wave of relief and excitement hit me as I realized that I had captured the exact image I had previously envisioned and set out to capture. Still numb and covered in goosebumps from disbelief, I remember walking away from my camera to decompress. Not gonna lie, I’m pretty sure I teared up a little bit, too. This collection of images were all single exposures with no photoshop or blending involved. In other words, the photos that came out of my camera are almost identical to what you see below. To capture the compressed look, I used a Sigma 150-600mm lens zoomed to around 510mm on my Canon 1DXII camera. Big thanks to Induro Tripods for providing me with the tripod and gimbal head used to make this shot happen. I’d also like to extend a big thank you to rock climber Tommy Smith for posing as well as rock climber Martina Tibell for belaying and assisting Tommy in his climb just before the eclipse and during our rehearsal the day prior. I also am extremely thankful for fellow photographer Ted Hesser’s assistance in this collection of images as he was very helpful when it came to the intricate positioning of Tommy within totality. I’m really proud of the images I captured and hope to photograph the next totality event in a couple years. If you’re able to travel to see it, I’d highly recommend it! Totality is something that everyone should try and experience.